« RPG’s: The RP means “Role Play!” – A Rant. This week on The Uncommon Geek, join us for a special collaborative review of the newly released, re-made RoboCop movie. Enjoy reading reviews from The Uncommon Geek AND Neo Ethereal as well as our first roadshow podcast! Hold onto your spats, because this one has defied our expectations, and is among the more unexpectedly well-executed re-makes in recent memory. However, be warned: spoilers await! The Uncommon Geek: When I first found out that Hollywood was redoing Robocop, I facepalmed. I asked myself, Why!? Why remake something that doesn’t need it!? The original has stood the test of time to the point where Detroit wants a statue of Robocop! Why Hollywood! WHY!! !” But, I made the decision to go and see it anyway. I told myself that I would go into the theater with an open mind to see what the movie has to offer. And I am proud to say, the new Robocop delivered, and delivered hard in the best way possible! As with any “reboot,” there are changes. One of the changes that I tilted my head to and went, “huh” to was Alex Murphy’s partner. In the original, officer Anne Lewis was a female police officer. And it worked. In the 2014 Robocop, officer Lewis is a male police detective. Jack Lewis. Not sure why they changed it, but it worked. In the 1987 Robocop, Alex was newly assigned to be Anne Lewis’s partner and the movie really didn’t allow for a lot of bonding between the two before Murphy was “murdered.” In the 2014 Robocop, Alex and Jack have been partners for quite a while, long enough for them to trust one another while undercover. Another thing that I thought was interesting, comparatively, was how in the 2014 movie, AI drones were already being mass produced by OCP, but only in use outside of the USA. The US Senate created the “Dreyfuss Act” which prevents the use of drones on US soil in the capacity of enforcement because they lack the emotion of what it means to be human. This mead to the coining of the phrase, “robophobic.” Also, the majority of the American people were considered to be robophobic. The pacing of the remake, I felt, was very close to the original. It wasn’t constant action but wasn’t constant drama. This version, like its predecessor, had a good balance of all elements. In this version, though, they did add in an extra element that was mind of glazed over in the original; and that is the psychological struggle with what happened to Alex Murphy. Not only from his point of view, but his wife and son as well. In the original, Alex’s wife, Ellen Murphy, was told that Alex was dead and her and their son moved on. Nothing more was seen other than flashbacks. In the new movie, Alex’s wife, Clara Murphy, signs consent forms to keep Alex alive as Robocop. But, we see her conflicted when faced with this decision. We get to see the progression of Clara and their son, David, attempting to deal with the emotional stress and anxiety of what is happening and how they deal with DPD and OCP not allowing them to see Alex. Not to mention how they have to deal with Alex practically becoming lobotomized personality and emotion wise. Some of the scenes in this new Robocop were redo’s from the original. The scene where Robocop was attempting to arrest the head of OCP in the original where he fought the ED 209 then was getting shot at by DPD was done in the 2014 remake, but in a slightly different order and way. But, the scene retained, in my opinion, quite a bit of suspense and sympathy for Alex. He was just doing his job, and he gets shot to hell and back for doing it to well. In all, this geek, who holds the original Robocop close to his warm fuzzy secret heart, enjoyed its new incarnation. It had quite a few nods to its predecessor and did not fail to deliver on emotion, character development or story. If anything, a prequel could be made to tell more about how this version of OCP became what it was. We here at The Uncommon Geek recommend seeing it knowing that it is how a reboot should be made. Unlike Star Trek. Neo Ethereal: Generally speaking, I don’t like re-makes. That applies to most media, but especially movies. Hollywood has become as notorious as ever for being so uninspired, so unoriginal, that movies that aren’t even as old as I am are already being re-made, to cover up serious lapses in creativity and vision. 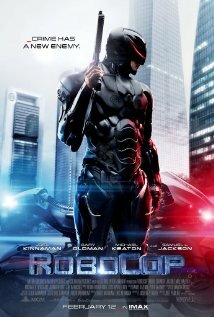 So, naturally, when I first heard about a re-make of Robocop, one of my favorite movies from the late 1980s, I balked. I thought, that this would be yet another classic science fiction/action movie from my youth, being thrown into the Hollywood re-make meat grinder. The trailers didn’t exactly ease my fears, especially when I saw a black-clad Robocop with a Cylon-red visor. I am elated to report, that RoboCop (2014) surpassed my expectations, and manages to, at least partly, buck the trend of classic movies being re-made into bad, contemporary cinema. My very first impression of this new film, was being reminded of the beginning of Metal Gear Solid 4, where we see robotic walkers patrolling the streets of a Middle Eastern city, in this case Tehran, Iran. Also present in RoboCop, as was in Metal Gear, is a presentation of a war economy, where the United States makes money off of policing the rest of the world, as well as using robots to enforce their military and political doctrines on other nations. It is a somewhat ballsy move on the part of the filmmakers to depict the U.S. as rest of the world’s bully in this near future setting, but I appreciated it, and it unfortunately has many roots in our present day reality. RoboCop (2014) follows a similar plot progression as the original, giving us time to get to know Detective Alex Murphy, his partner, and his family, before an attempt made on his life leaves him in critical, near-dead condition. The exact manner in which Murphy ends up this way differs from the original, but the end result is basically the same; unless Omni-Corp, the mega-corporation that is the chief proponent of robotics in the world, uses Murphy for their first human/robot hybrid, the Detective will be as good as dead. What is different in this new film, is that Murphy’s wife consents to Omni-Corp using Murphy for their experiment, and that unlike the original, the family remains involved in the story. Instead of just throwing Murphy back into action almost as soon as he is rebuilt, this new film takes its time, showing us the extent of his rebuilding and the way he is slowly dehumanized by Dr. Dennett Norton (played by the always fantastic Gary Oldman). Oldman’s performance is my favorite part of this film; he more than ably delivers a sympathetic character with a believable motivation for his actions. Dr. Norton just wants to help people rebuild their lives with his technology, but he needs the deep pockets of Omni-Corp in order to keep his research going. His work on creating a cyborg out of Detective Murphy is based on an intention to do good, and to give Murphy some semblance of his life back, but it just spirals out of control. The road to hell, as the famous saying goes, is paved with good intentions. I was also enthralled by the examination of Murphy as he slowly comes to terms with his new cybernetic life. This sequence of events is paced well, and is visually striking. There are a few moments in this stretch of the film that reminded me of games like Halo, when Murphy is plugged into a simulator and competes against a computer for a top score in a shooting gallery. What I didn’t like, was the lack of a really great bad guy to pit RoboCop against. There are gun smugglers, dirty cops, and a sleazebag of an Omni-Corp CEO, Raymond Sellars (played by Michael Keaton), but in a teen-friendly PG-13 setting, none of them really strike me as being believably menacing or threatening. Indeed, RoboCop’s biggest adversary in this movie seems to be, aside from his own psychological trauma, corporate greed, the naivete of Americans, and a world that is more interested in being “safe” than being free. The film gets in a requisite amount of action in the endgame, and seems almost on the verge of saying something profound about human will triumphing over the programming of a machine, but never fully delivers on it. The lack of blood and other “violent” content really derails the tension and immersion of the film’s myriad shoot-outs, and the resulting action is nothing we haven’t seen before. However, RoboCop (2014) isn’t totally brainless, and is willing to dive deeper into the transformation and struggles of Alex Murphy than we’ve seen before. RoboCop’s new “tactical” black suit and red visor are temporary aberrations and are dismissed in the film’s coda. This movie will never challenge the original by any means, but as far as re-makes go, this is definitely among the better that I have seen recently, and for fans of science fiction it’s worth watching at least once.